Scott Reinartz is a lucky guy! 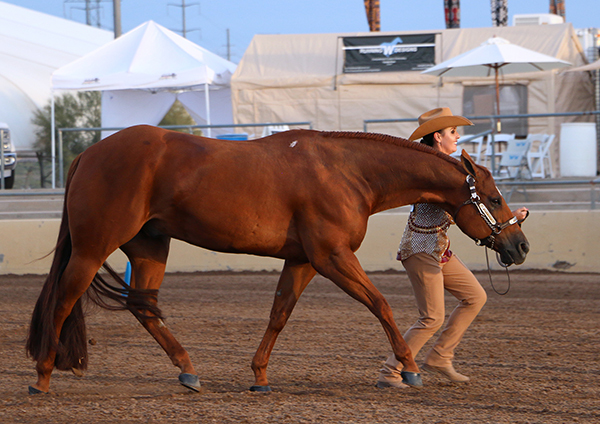 The 2019 Arizona Sun Circuit debuted the National Championships in Showmanship, Horsemanship, and Equitation March 2-10 in Scottsdale, AZ. There was a great deal of buzz around this event leading into the tournament style competition. The top ranked 64 competitors in the country, in youth, amateur, and select divisions, were invited to participate. Being consistent each day of showing was the key to moving forward in the brackets to reach The Final Four. The semi finals and final rounds proved to be very closely matched competitions. The head-to-head showdowns saw The Final Four reduced to two, who then had five minutes to review the finals pattern and put it all on the line once again. Exhibitors who made it to the finals were all in agreement that not only was the format challenging, it was a great deal of fun. All of the top four exhibitors received embroidered leather bomber jackets, and the champion was awarded a finely styled buckle. 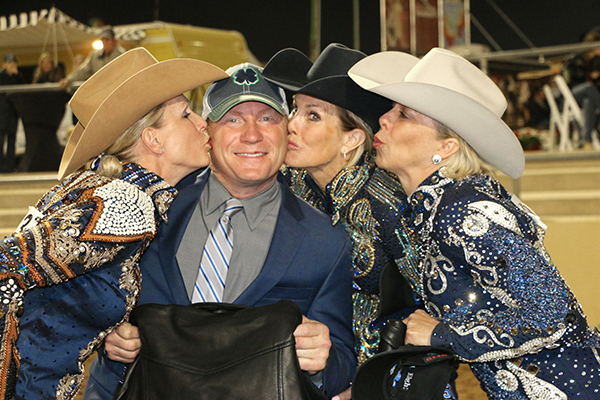 Karen Zarda was named the Select Horsemanship National Champion. Karen loved the format, saying, “It’s really a lot of fun and an opportunity to test yourself.” Rounding out The Final Four who rode the semi finals pattern were Dan Yeager with Cracking The Code, Scott Reinartz with Investin A Goodbar, Karen Zarda with Ima Lazy Cowboy, and Linda Coakley with Rockstar N The House. The last day of Sun Circuit saw the Equitation Finals. Once again, The Final Four were very evenly matched through the patterns. In the Amateur division, the semi finalists were Shelley Grissam with Dun Ben Noticed, Angela Fox with HP The Rusty Fox, Carey Nowacek with Lethals Hot Weapon, and Ali Edison with Hez Blazin Trouble. 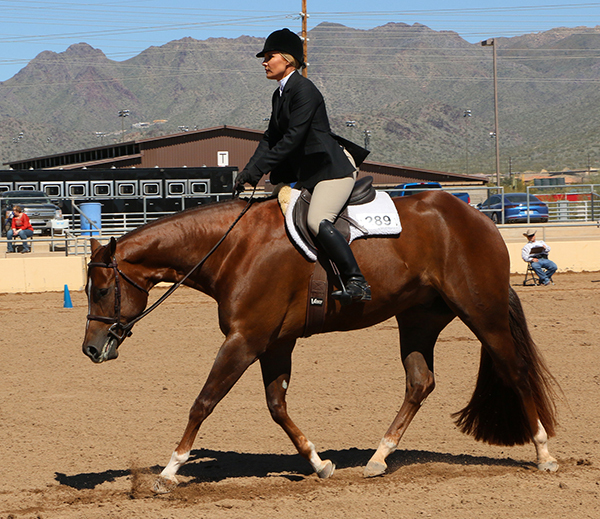 In the end, it was Angela Fox riding HP The Rusty Fox who was named National Champion in Equitation. The select semi finals welcomed Laurel Champlin with The Production Line, Jennifer Coleman with Coats N Socks, Anne Wilson with Give Me The Goods, and Sharon Forbes-Hanks with Hot Lil Assets back to the arena. Sharon Forbes-Hanks and Hot Lil Assets prevailed to become Champions. Since the youth showed only two times, their second go was named the Exceptional Eight. In Youth Showmanship, Jessica McAllister, Alexia Rutledge, Hanna Olaussen, and Cori Cansdale worked the challenging pattern. Alexia Rutledge led Dreamin With Me to be named the National Champion. The Final Four finalists in Youth Horsemanship were Leah Anderson, Jo Jo Roberson, Lily Anderson, and Ella Petak. Lily Anderson rode Lover Treat Me Good to be named the National Champion. 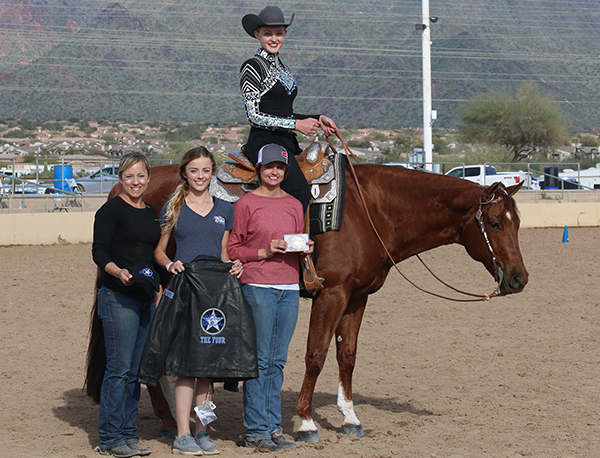 The Final Four Youth Equitation exhibitors who advanced to the finals were Jacqueline Potwora, Madison Parduhn, June Roberson, and Tatum Keller. These ladies showed enthusiastic support for each other as each worked the pattern. They were surprised by a last minute announcement that they had to drop their irons for the first section. 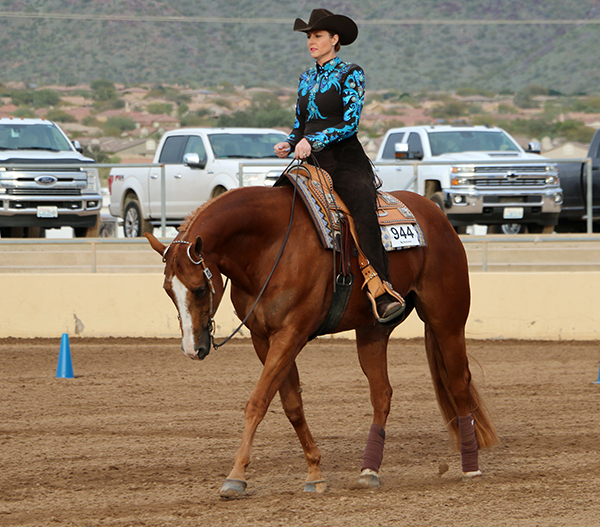 Ultimately, Madison Parduhn’s ride on Shesa Hot Selection earned her the title of National Champion. Exhibitors are always looking for a new, fun challenge to spice up their show season. The enthusiasm for the National Championships signals that Sun Circuit has found just the right event to add to its schedule. The 2020 tournament will undoubtedly be highly anticipated. Next year’s dates will be February 29th through March 8th. Visit SunCircuit.com for all the latest news.